This picture was taken in April 2006 during the WalkIslay 2006 walking week early during the walk on The Oa. 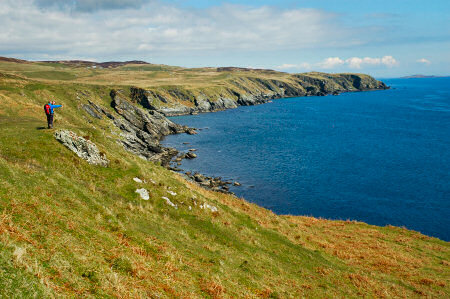 The view is along the south eastern coast, looking north east towards Port Ellen (which you can't see from here). But you can see Texa on the horizon, the island just off Laphroaig. The cliffs are not particularly high here, they are much higher further west. The two walkers (Brian from Wales and I'm not sure who the other one is) give you an idea of the height of the cliffs. There wasn't much birdlife I can remember, as far as I can remember this is due to the formation of the cliffs as I learned from a wildlife talk by Malcolm Ogilvie I had attended a few days earlier: The cliffs (or the cuts in the rock to be precise) in this area are mainly 'vertical' instead of 'horizontal', leaving very few opportunities for birds to nest.